This is clearly not good news for snow cover. The result has been that low lying areas that did not have a deep snow base have been struggling and in some cases closing. However most of the big resorts in the Alps are still benefitting from the big snowfalls they received in December/January and although conditions are currently prematurely ‘Springlike' - snow cover is not a problem for them. Some resorts in Austria have reported new quite good falls too. It will be warm with the weather sunny at least up to Sunday with temperatures varying between +2 degrees on higher mountains peaks in the country right up to and up to 22 degrees in lower areas. Although the slopes are now quieter and the temperatures warm, the ski season is still far from over in France. After some light snowfalls in the middle of last week (5 to 20cm), the weather is mostly sunny and some small, low lying ski areas have already closed their ski areas for the season (especially in the Vosges area). However snow depths remain good in the Northern Alps (still 290cm at the top of the slopes of Chamonix, 335cm in Flaine and 330cm in Alpe d'Huez), the Southern Alps (160cm in Montgenevre, 130cm in Serre Chevalier ) and the Massif Central (110cm at Mont Dore). There has been almost no new snow reported in Italy in the past week. Of the few resorts that did report new snow, Limone on the easterly side had one of the biggest accumulations with 25cm (120 inches) of fresh. However snow depths remain sound at many areas with Passo Tonale - usually open with glacier skiing until June - reporting 330cm (11 feet) of snow on upper slopes and Arabba in the Dolomiti Superski region on the Sella Ronda circuit not far behind with 280cvm (more than nine feet). Warm sunny weather is the norm in Switzerland this week. A lot of sunshine welcomes skiers to the slopes, who still have fresh snow from last week at many areas to enjoy. But temperatures are getting very mild - up to 20 degrees - all over the country. Les Prés d'Orvin ski resort reports the most snow in the country in the past week - 60cm (two feet). Loetschental had 35cm and Grindelwald and Gstaad 20cm each. 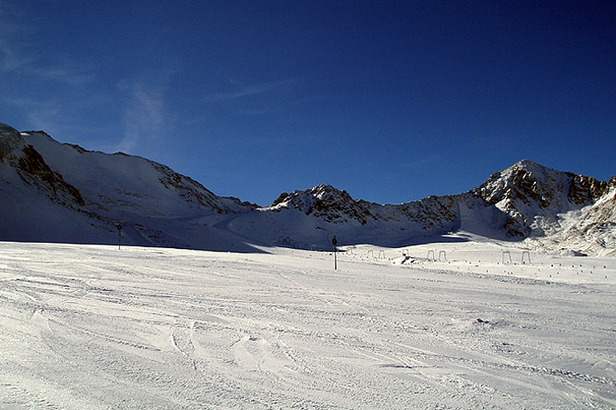 It has been sunny with no new snow reported in the Pyrenees ion the past week. However again most areas are in reasonably good shape with up to 2.7m/9 feet lying (Baqueira Beret, Spain) on upper slopes although lower runs may be getting thin at lower resorts (typically 30-60cm/11-2 feet depth) . In Andorra VallNord says snow depths are between 1.1 and 2.2m (approx 4-7 feet), and in the French Pyrenees there's 235cm (7.5 feet) at Cauterets, 190cm (67.3 feet) at Luz Ardiden. Scandinavian ski areas have largely done better than most of the rest of Europe over the past week with many ski areas getting some new snow and some - such as Voss in Norway - as much as 53cm (19 inches) in the past seven days. There has been no skiing in Scotland since February after warm weather melted snow cover. Centres hope to re-open if there is a major change in the weather and prolonged snowfall.